Scarce map showing Insular California. 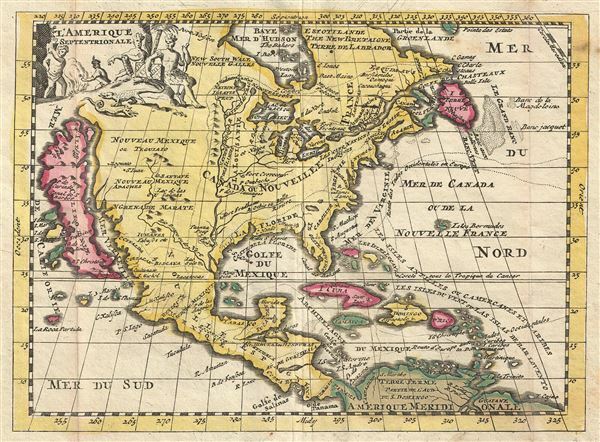 This is a very scarce example of Daniel de La Feuille's 1702 map of North America. It covers all of North America from the Hudson Bay to the Gulf of Panama. The Rio Grande (Rio Bravo ou de Nort) and the Mississippi Rivers are the only two major rivers depicted, with the later originating from a lake in northern Canada. The English colonies along the Atlantic seaboard are loosely indicated. Baja California was subsequently discovered in 1533 by Fortun Ximenez, who had been sent to the area by Hernan Cortez. When Cortez himself traveled to Baja, he must have had Montalvo's novel in mind, for he immediately claimed the 'Island of California' for the Spanish King. By the late 16th and early 17th century ample evidence had been amassed, through explorations of the region by Francisco de Ulloa, Hernando de Alarcon and others, that California was in fact a peninsula. However, by this time other factors were in play. Francis Drake had sailed north and claimed 'New Albion' near modern day Washington or Vancouver for England. The Spanish thus needed to promote Cortez's claim on the 'Island of California' to preempt English claims on the western coast of North America. The significant influence of the Spanish crown on European cartographers caused a major resurgence of the Insular California theory. In the West Indies La Feuille marks, with dotted lines, the course of Spanish galleons to and from the Caribbean. Following the dotted line, La Feuille identifies the Spanish treasure fleet's entrada into the Caribbean via the passage between Granada and Trinidad. The fleet then sailed westwards, skirting the Spanish Main until they reached Cartagena, where they rested and provisioned before heading northwards, rounding western Cuba and stopping in Havana. Using the strong Gulf Stream current - shown here - ships would sail northwards from Havana while being steadily forced to the southeast thus alighting at the deep water port of Veracruz. On the return, laden with silver from the mines of Mexico, the Spanish fleet took advantage of eastward blowing trade winds, which helped to overcome the strong current on the sail to Havana. From Havana they would travel northwards via the narrow passage between Florida and the Bahamas before cutting eastward and out to sea at St. Augustine. It was here, in this crucial passage between the English dominated Bahamas and Spanish Florida, where the most nefarious pirates lay in wait for their prey. This map includes a title cartouche in the upper left quadrant beautifully illustrating stylized American Indians, a snake and an alligator. This map was prepared for inclusion in the 1702 edition of De la Feuille's Atlas Portatif. La Feuille, D., Atlas Portatif, ou le nouveau Theatre de la Guerre en Europe; Contenants les cartes geographiques, avec les plans des Villes & Forteresses les plus exposees aux revolutions presentes (Amsterdam) c. 1702. McLaughlin, G, The Mapping Of California As An Island. An Illustrated Checklist, 147.